115 Years as a Family Owned Business — Nuhn Industries Ltd.
As Canada celebrates 150 years, Nuhn is proud to celebrate 115 years as a family owned business. In 1902, Simon Nuhn opened a Blacksmith shop in Wartburg, Ontario. Four generations later, the company remains in Ontario, but ships their products all over the world. Over the past 115 years, Nuhn has developed some of the most innovative products in the market. 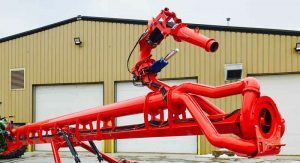 This timeline shows the product evolution at Nuhn Industries, and how the family owned business grew to become the leading manufacturer of manure management equipment. To learn more, visit Nuhn History. The Past 115 Years at Nuhn Industries Ltd.
1902: Simon Nuhn opened a Blacksmith Shop beside his families general store in Wartburg, Ontario. Simon specialized in making horseshoes. As the business grew, he began making wagons, wheelbarrows, sleighs & harrows. 1947: After the passing of Simon in 1947, his son Wilfred carried on the family business. Wilfred had been raised at his father’s knee, and was a well qualified blacksmith. 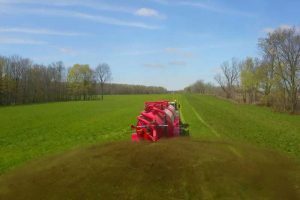 The company focused on repairing farm equipment, but adapted to changes in the farming industry. 1962: Wilfred’s son, Dennis, carried on the family business at the age of 17 in a small two car garage. He brought a vivid imagination, and the company began making it’s own equipment. As the business expanded quickly, Dennis prepared to build a larger shop and moved the two-car garage down the road by driving a tractor with front end loader underneath the structure to his brothers house. That same year the first addition was constructed. A total of 5 additions were built onto the Wartburg shop. 1965: One year later, Dennis made his first liquid manure tank. It was fabricated from an old gas tank with airplane tires. 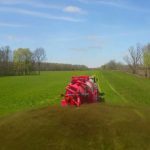 From this point forward, Nuhn Industries specialized in manure management equipment. 1984: In 1984, Nuhn Industries Ltd moved to Sebringville, Ontario where a 15,000 square foot facility was built. 1985: Dennis designed the Magnum Series manure tanks which later became the workhorse of the industry. 1998: The first addition was built in 1998 to make the Sebringville shop 25,000 square feet. 2002: Nuhn Industries Ltd celebrates 100 years in business! 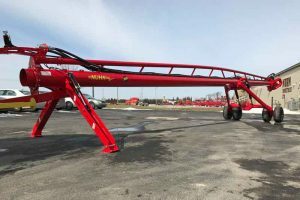 “Our business has survived two world wars and the Great Depression,” says Dennis Nuhn, President of Nuhn Industries Ltd. “We give credit to our loyal customers for our continued growth and prosperity”. 2003: Dennis and team builds the first Quad Train manure tank in the industry. The low maintenance design is simple, rugged and reliable. 2009: Dennis’ son, Ian, grew up working alongside his dad and had a passion for designing innovative and efficient equipment. At age 19, he designed and patent the Triple Port Header Series Pump Design. The innovative design mixes in half the time while using half the energy. 2013: In 2013, Ian Nuhn and team designed and built the first Lagoon Crawler prototype. The one of a kind manure agitator was the first amphibious agitation boat in the industry. Also in 2013, Nuhn created the Electra-Steer tank line, with the most advanced electronic steering system on the market. The tri-axle design provided massive flotation without sacrificing maneuverability. 2015: The fifth addition was built onto the Sebringville shop, to make a total of 100,000 square feet! 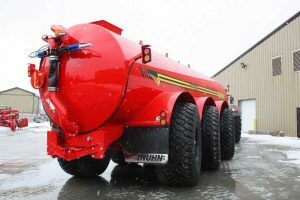 2016: The Quad-Steer Articulating Tank was the first tandem steering tank on the market. With unbeatable capacity, the tank provides excellent road and field maneuverability. 2017: The first 12” Header Series Pump line was designed and built in 2017. The White Iron header provides exceptional durability in sand, and pumps 12,000 GPM.